One of the most wonderful customs surrounding Rosh Hashanah, the Jewish New Year, is the pairing of apples and honey. The apple slices are dipped in honey and eaten to signify a wish for a sweet New Year. But I’m always struck with the happy coincidence that apples are ever-present this time of year, a time of harvest, apple picking and back-to-school rituals. 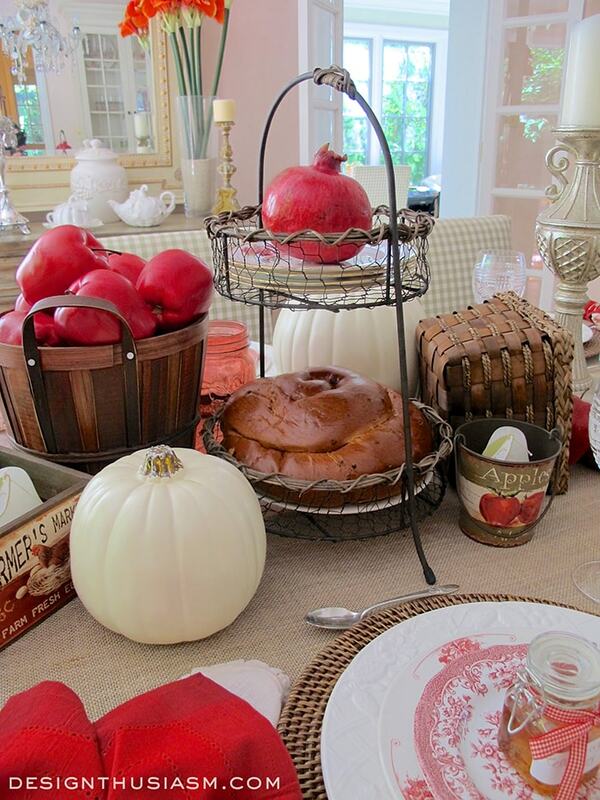 So naturally my holiday tablescape is often constructed around an apple motif. 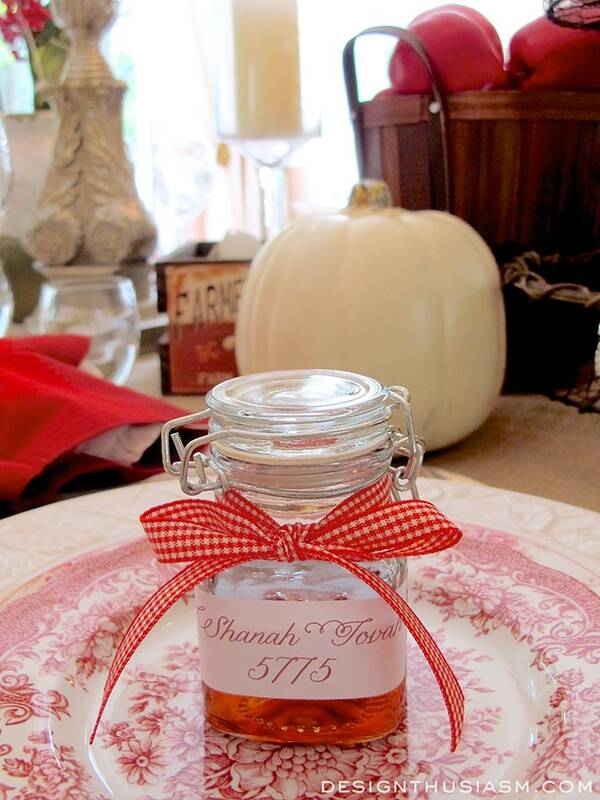 To give the sweet elixir the presentation is deserves, I set each place setting with miniature canning jars, tied with matching ribbon and decorated with the Hebrew greeting, Shanah Tovah (good year) and the new year, 5775. Vintage transferware plates lend a celebratory elegance to the scene. 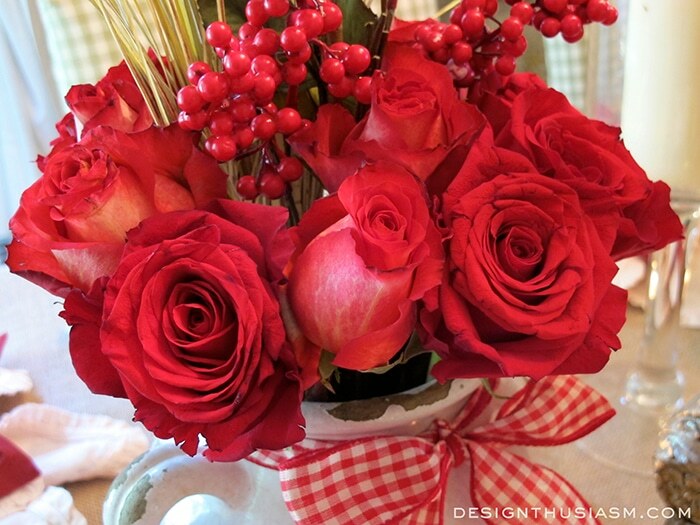 My floral arrangements were based around red roses, special enough for the event, yet tied with casual checked ribbon and flecked with berries and stalks to be reminiscent of a day in the country picking apples. 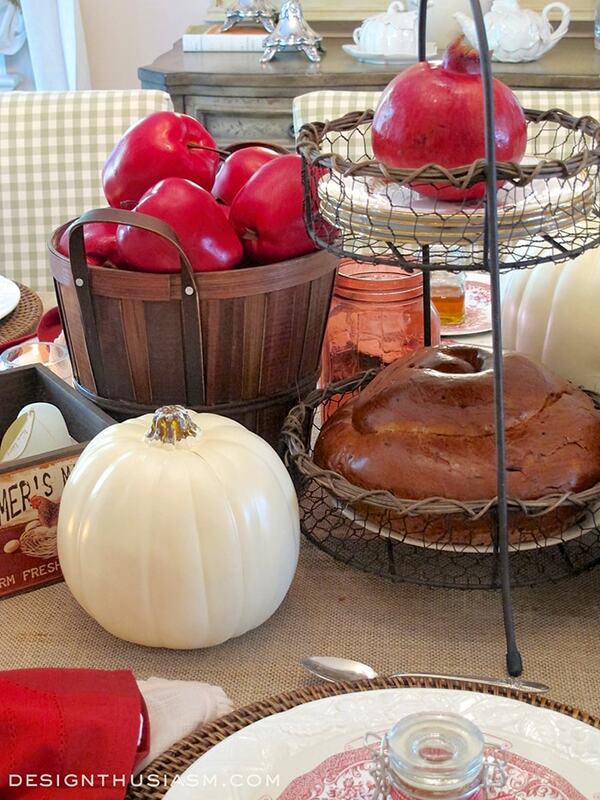 The wire rack centerpiece from Home Goods holds the round challah, another custom unique to this holiday, when challahs are baked round to signify the cyclical nature of the year. The pomegranate represents the good deeds commanded by God, as the fruit is reputed to have 613 seeds, the same number as the total number of commandments. 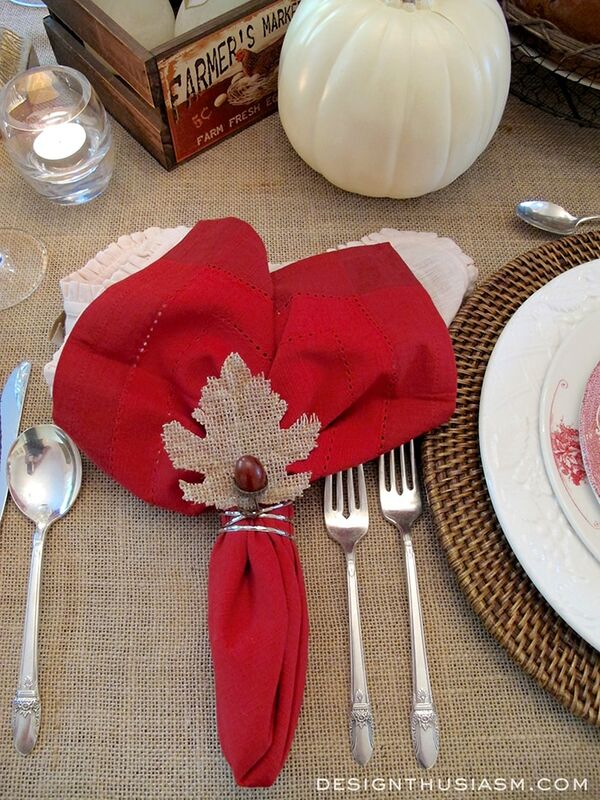 For napkin rings I started with a simple silver base from Pier 1 and hooked around it burlap leaves to match the tablecloth, and acorns from Michaels. 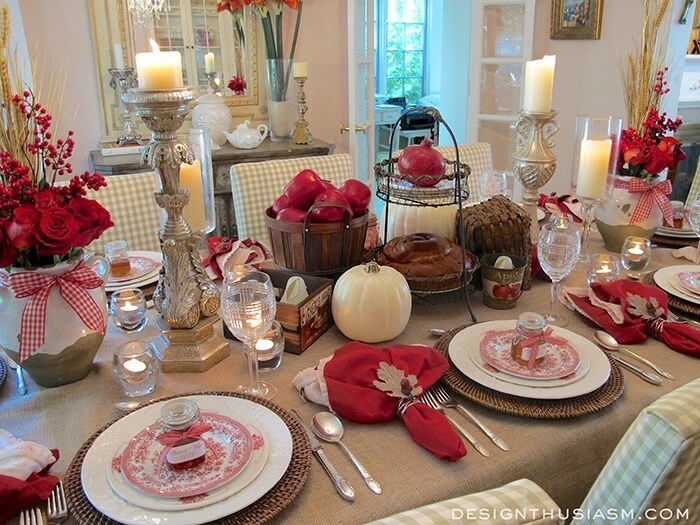 Red napkins are from Pier 1. 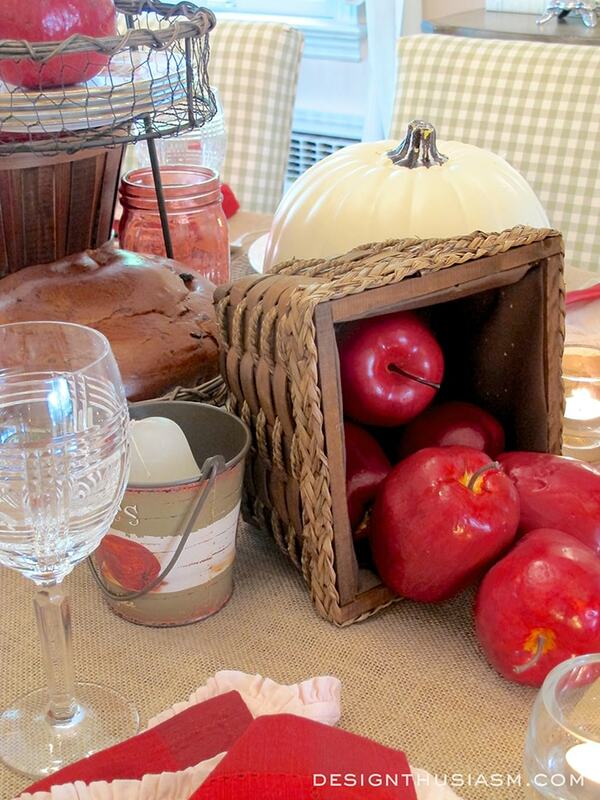 Apples were scattered about the table, spilling from baskets and piled in buckets. As a balance to the red, I mixed in white pumpkins to foreshadow the coming season. Rattan chargers are from Pier 1 and further reinforce the rustic/elegant balance. 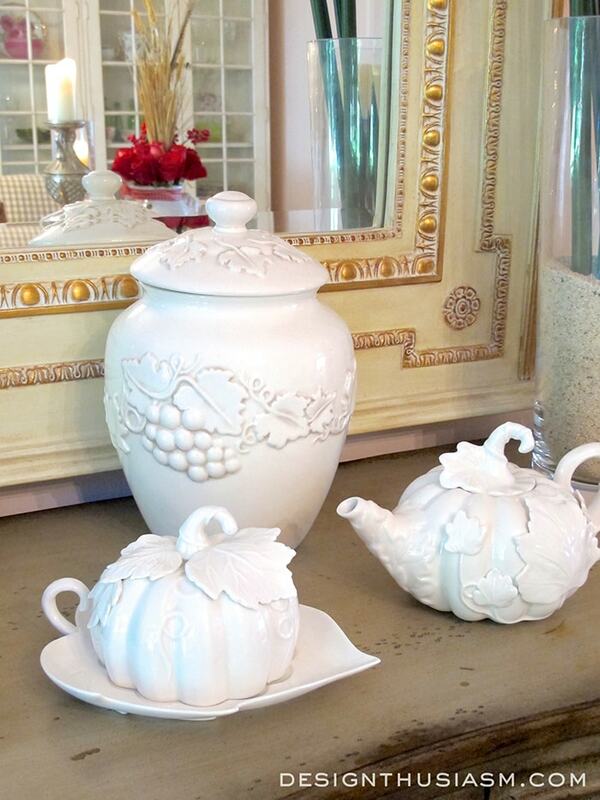 On the sideboard I placed creamy white pumpkin ceramic pieces from Home goods and a vintage cookie jar, another nod towards the coming Fall. Thanks for visiting my holiday table! Linking with Tablescape Thursday, From My Front Porch to Yours, Home and Garden Thursday, Feathered Nest Friday, Show and Tell Friday, Silver Pennies Sundays, The Scoop, Inspire Me Tuesday, Twirl and Take a Bow, LittleRedBrickHouse SoMe2, Wow Us Wednesdays. What a lovely idea, I had not heard of that Jewish tradition. My fathers sister was married twice (her first husband died), both were Jewish and she followed the traditions but I don’t remember her doing this one. 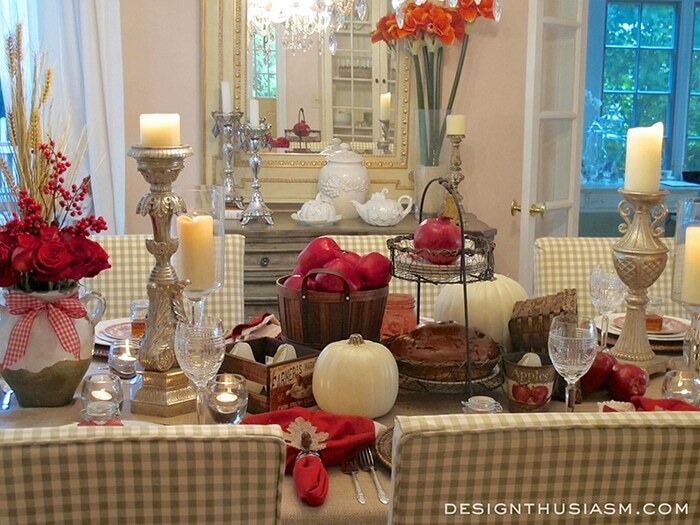 Your table looks fabulous, you must have so many table settings and plenty of space to store them away :). What a lovely table! 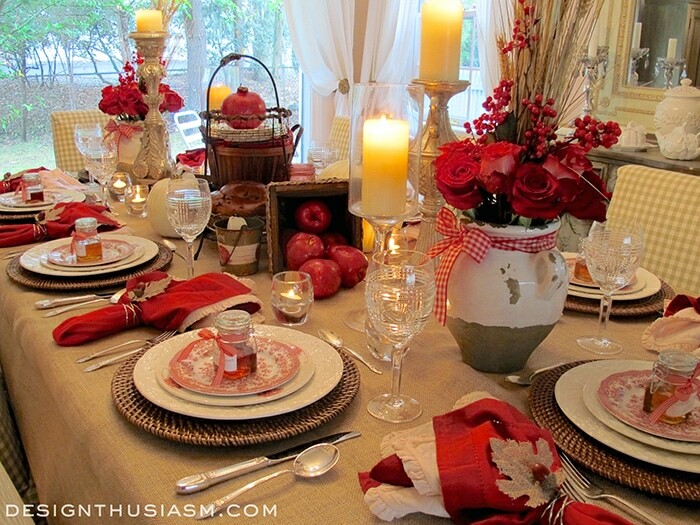 There is something so beautiful about red and how it just makes a table pop! Your reds are everywhere and look so gorgeous with your chairs too. How fun! I learned so much about the Jewish traditions. 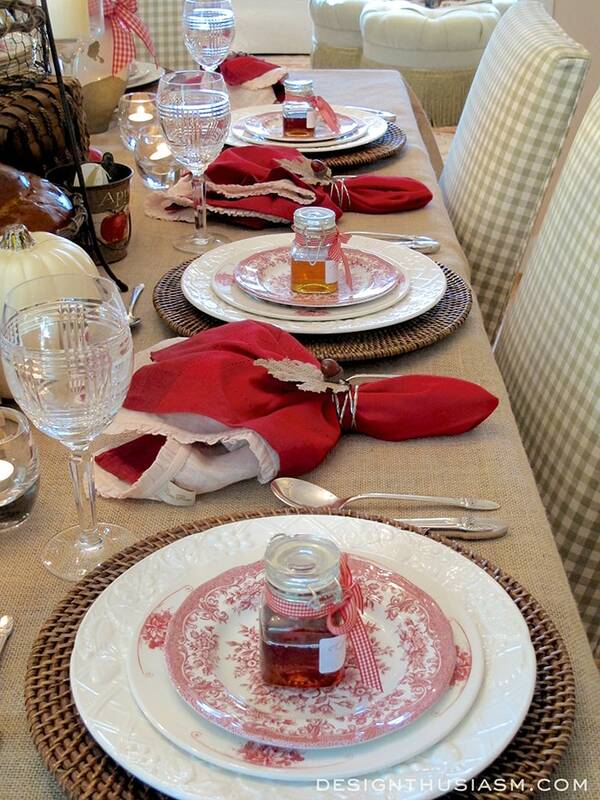 What a joy to sit down to this table and celebrate Rosh Hashanah! I love knowing the year too – 5775!!! Thanks Jacqueline! It’s nice to be able to share and have people appreciate your traditions… 🙂 Thanks for taking the time to comment!! Susie, thank you for taking the time to appreciate the details and also to tell me about it… 🙂 It means a lot to me! Hello there, Lory! I’ve gotten an education on top of a truckload of eye candy today!!! It’s always good to learn things about other religions and cultures. I should have majored in sociology because I really, really enjoy learning about and studying others. My downfall was that I hate to fly and travel, so…! 🙂 But thank you for the lessons. I had heard about the pomegranate seeds but didn’t know about the round challah. THAT’S why I’ve seen those in the bakery recently! This is gorgeous! The roses are so, so pretty and work so beautifully for the occasion. I like how you slipped in a little casualness by adding the gingham ribbon. The distressed pots really look terrific, too. The ribbon and pots don’t allow the roses to get too, too serious. The jars of honey are so sweet…literally and figuratively! What a great idea! 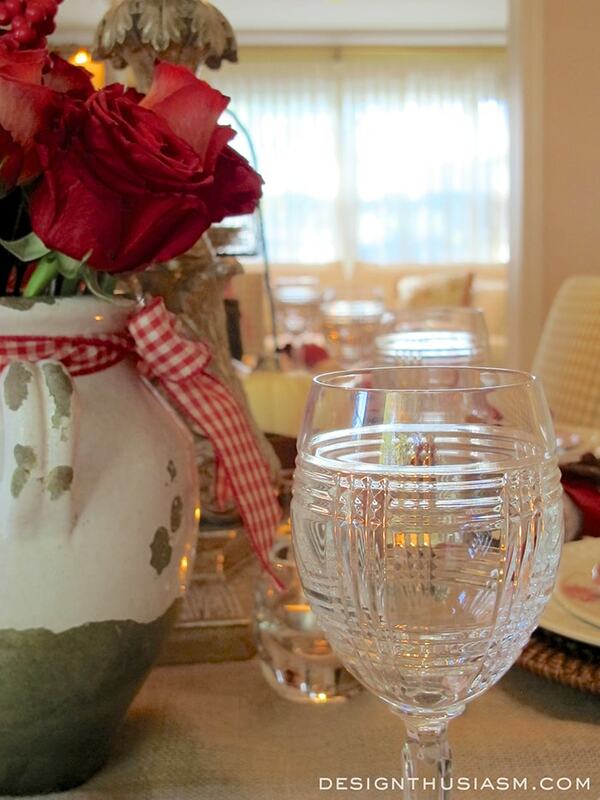 I love the way you tied a similar ribbon on them as on the vases. Nice segue! You paid a lot of attention to detail. It’s beautiful! Happy Fall!!! Wow Lory! The table is beautiful! 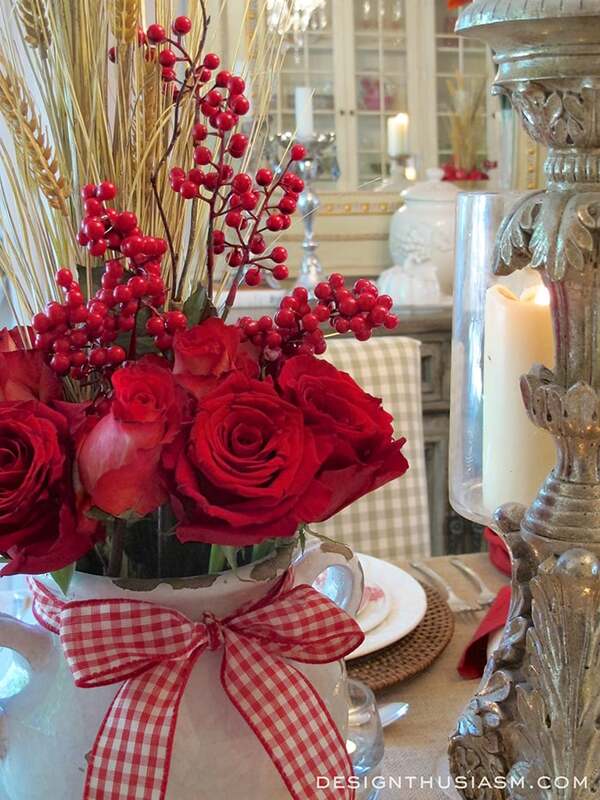 I love the roses and apples together on the table with the red berries!! Great photos and I learned about your traditions! Love it all! 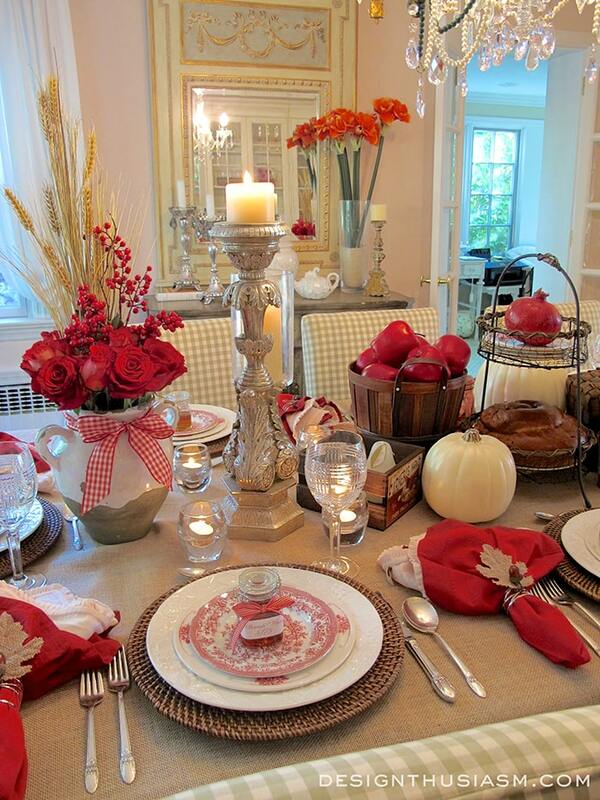 Oh, what a gorgeous table Lory!!! Loving the combination of apples and roses! You attention to detail is amazing! Thanks so much for sharing the customs of your beautiful sacred day! Thank you so much, Yvonne! I truly value that comment coming from you… 🙂 Thanks for taking the time to check out my blog!